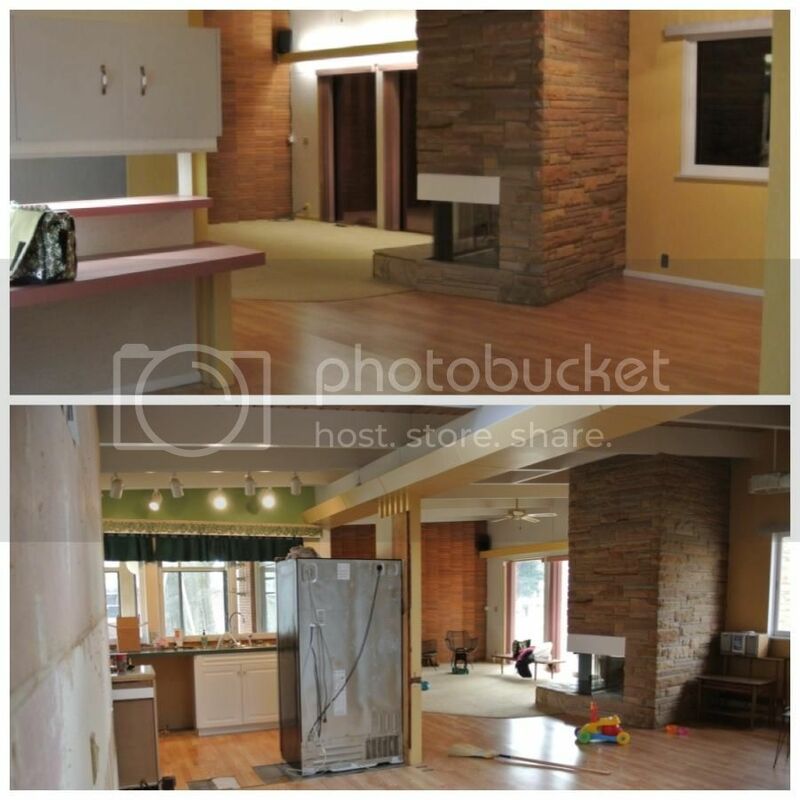 MidModMich - mid-century living in Michigan: Demo Mode! Demolition began 10 weeks ago. We closed on the house on November 5th, but took the first two weekends to clean out the billions of leaves that the previous owner so kindly left for us. And because of where the house is, we had to haul them away - no burning allowed! So, after two long weekends of loading leaves, branches, yard debris into a borrowed trailer, we finally stepped inside the house to start taking down the old to get ready for the new. 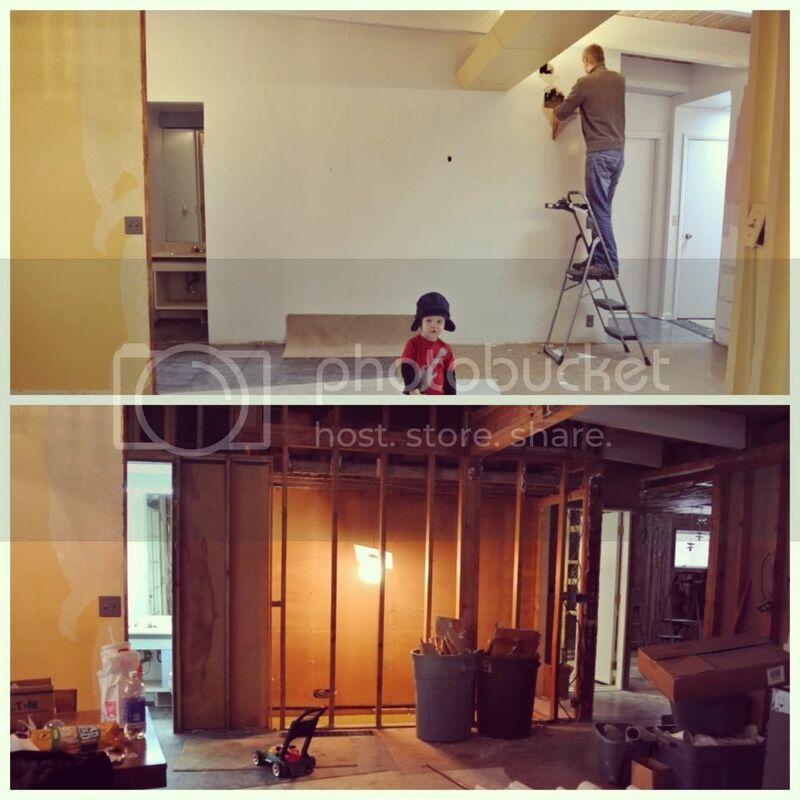 Honestly, when we bought the house, we thought we'd make some updates, but once we talked to builders, we decided to take down more than we did when we first walked in the door. And the more time we spent there working, the more projects we decided on. My favorite one we "added"? Taking down the walls around the stairs to the basement and making them an open staircase with metal railing like we loved in the very first house we wanted to buy! The first weekend went super quickly and it felt like we made a ton of progress right out of the gate! 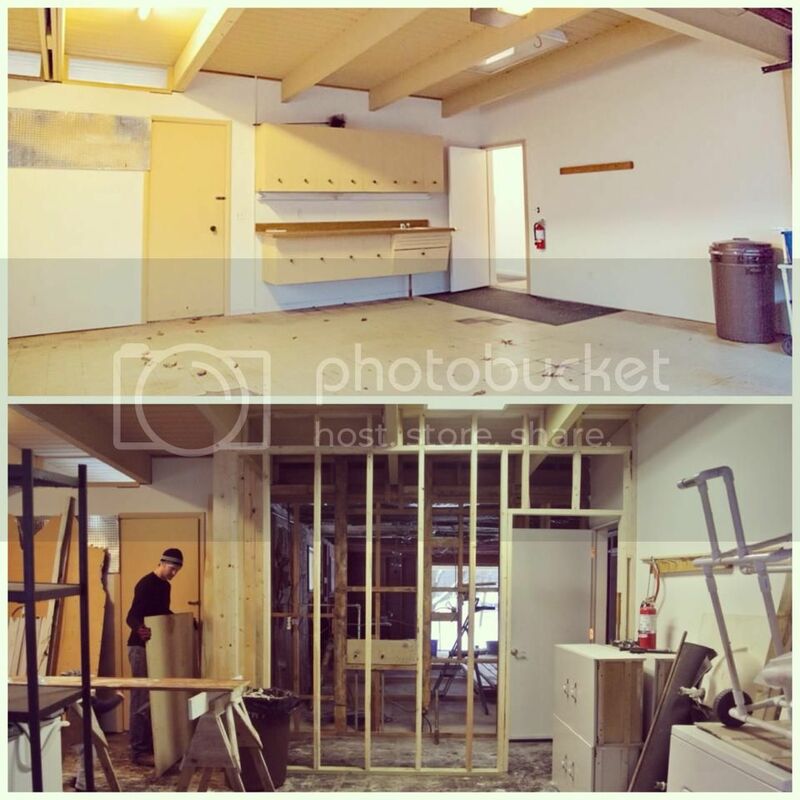 We took down the odd little built-in office area, above, to make way for our expanded kitchen. We also got the partial wall down between the old galley kitchen and the odd office area, which will turn into a lovely kitchen area with large island. I'm pretty stoked about this portion of the house, because I know we will spend a lot of time in here. The next weekend we worked on the random additional wall someone had added at some point near the front door. We think they wanted a more formal "entryway" but we realize they might not have envisioned how the original owner liked everything open. This was one of the things we hated most about the house when we walked through, and I was SO glad to see it go! It took Greg a few hours to get it down, and it looked better instantly! The following weekend, our friends Mark & Dee join us. It was a HUGE help, and their manpower (and crockpot of chili!) was priceless. 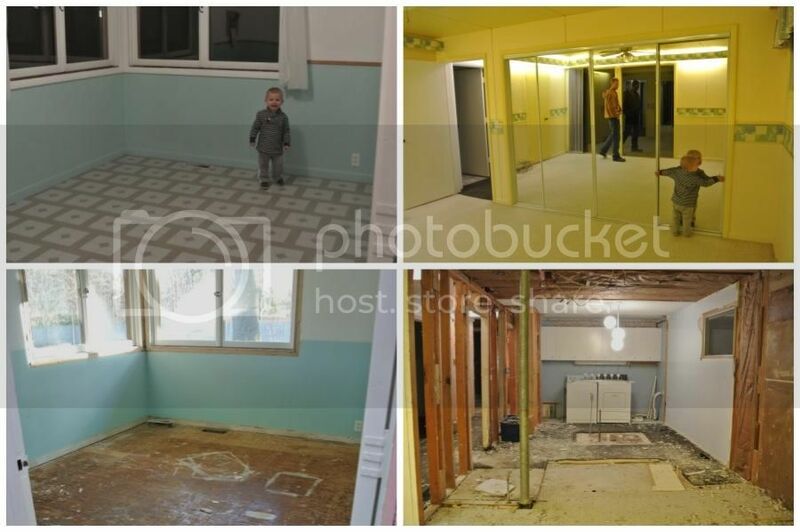 Mark & Greg got out the terrible old acrylic bathtub, awful double sink, and the old master closet. It was probably the biggest work weekend we've had! Once the guys did all the heavy lifting, it was clear to get out all the debris, a million nails in the studs, and take out the floors to access the crawlspace. Our builder has since put new subfloors in, and today I was there, and all the walls are studded and ready for pipes and lighting! And the other weekends we've slowly been working away on this and that. With two layers of drywall on each wall, and lots of layers of floors - laminate, sticky tiles, old laminate, carpet - all stacked on top of each other, it seems we keep taking out tons of "ick". 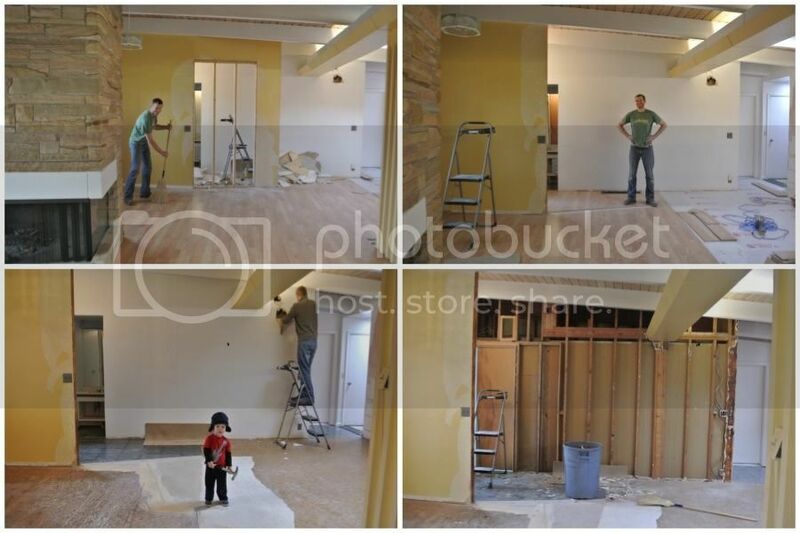 We know that most people take the "easier" way out and just go over the old stuff, but we are SO happy we decided to see what was in the walls/floors and start fresh. One builder (who we didn't hire) suggested "just drywalling" over the old stuff. Little did he know there were already two layers. Man, am I glad we did what we wanted to do! And here was another big project, which we held off on pretty long, since the stairs are open to the basement now, and Eames needs to be careful....Greg got the walls down last weekend. And today when I was there, the new beam was installed across the whole house, and all the studs are down from around the stairs. It's almost open - the icky little bathroom is still there, since that's the one the workers are using right now. Another exciting part of the first floor is the laundry room we added in the garage. This was a project we thought up after walking through with one of the builders in the very beginning. They got to talking about laundry in the basement, and I wanted to avoid that since we are on a septic system, and failing pumps in basements means lots of water on your floor. And since we are carpeting down there, I wanted to avoid that if at all possible. Plus, main floor laundry sounds like a dream. So, we added an interior room which is only 44" wide, in the garage, right off the kitchen. We will stack our washer/dryer in the corner, and have a wee bit of storage in here (17" shelves to the right of the w/d). It will also serve as a mudroom when you enter the house through the garage. We have purchased narrow shoe cupboards from IKEA and hope they will work in the tight space. We also plan on having coat hooks in this space, since we will enter from the garage through here, and the entire house is void of a coat closet. No joke. I am going to try and get to the house tomorrow morning to take some photos of the house one last time before more happens - the builders are working a lot during the week, so it seems to be going much quicker now that we're not doing all of the work. Sharing makes the blog world go 'round, but credit is essential. Content from the MidModMich blog may be partially reproduced, however proper credit and an active link must accompany any reproduced materials. 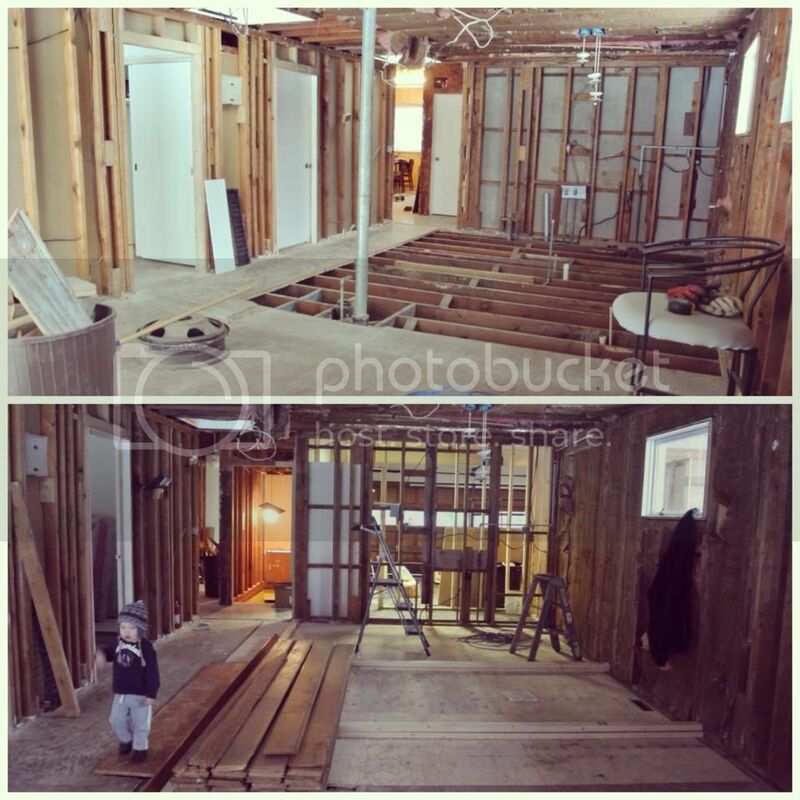 ©2014-2017 True Home Restorations. All Rights Reserved.